For the rest of us working-class types, a boating holiday (be it a crewed yacht in the islands of the Caribbean, or a do-it-yourself Florida Keys bareboat charter) is something we plan far in advance – including squirreling away our pennies to pay for this special experience. When affordability and value matter, it’s important to lock in a great charter price and not get blindsided by unexpected cash outlays. COMMUNICATION FEES – The idea of an “all-inclusive” charter rate is a bit of a misnomer. Many Caribbean-based charter yachts offer all–inclusive rates, but carefully read the small print on your charter agreement. One item that is rarely included is the cost associated with using the yacht’s onboard communications system. This includes cellular phones and internet connectivity. Unlike back home, cellular and internet service is very expensive in the Caribbean – often $1 or more per minute. With the whole family logging on to check emails, staying in touch with the office, friends, and family adds up quickly – you can easily incur communication fees of $500 or more in a week’s time. SPECIAL ALCOHOL REQUESTS – Many all-inclusive yachts offer a “ship’s bar” in the cost of the charter. This means the yacht will provide beer, house-quality wine, and some hard alcohol. But beware – if you request certain top-shelf brands or vintage wines and champagnes, you could be in for a rude awakening when your skipper hands you an invoice for, “special requests” at the conclusion of your charter. While some islands offer duty-free alcohol, this is not for local consumption, and premium brands in the islands are often 3 to 4 times as expensive as the same brands back home. DELIVERY FEES – one of the great joys of a Virgin Islands yacht charter vacation is the flexibility – you can come and go as you please, when you please – all at your own pace. Sometimes, charterers decide to conclude their charter in a different place than where they started. Your trip might commence in St. Thomas, USVI, for example, but you’ve looked at a map and feel an adventurous cruise concluding in St. Martin sounds like fun. It is YOUR yacht for the charter – everything’s up to you! Most yacht owners and crews are more than happy to accommodate your wishes for everything – after all, this is your fully-customized vacation. However, there could be a hefty cost to end in a port other than where you began your odyssey, and if you’re not careful, you could be left footing a “delivery” bill. The technical term is “re-positioning” – the cost of fuel and crew salary to return the yacht, after the charter has concluded, back to its home port. 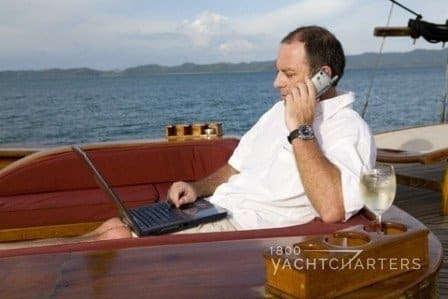 Depending upon how many days it takes the crew to return the yacht to its homeport, you could be looking at a fee as low as $500 to as high as $1000 for a sailboat, and double that for a motoryacht. Jana’s Tip – ask your charter broker before signing your charter agreement if there will be any delivery fees if you end in a port other than where you began your trip. If there is a fee, ask your broker to approach the yacht owner and see if the fee can be reduced, or even waived. Oftentimes, owners will absorb the cost of re-positioning, in order to secure your business. Avoiding these budget-blowing pitfalls can save hundreds of dollars and keep your trip as it should be – a memorable experience to cherish for a lifetime. Want more money-saving yacht charter tips? Contact the team at 1-800 Yacht Charters at 1-800-922-4824 or via our 24 hour hotline at 305-720-7245. What questions do you have about the costs of yacht charter vacations? We’d also love to hear about your experiences when chartering! Please comment below!